The 2019 Subaru Ascent is the largest vehicle in the brand's history. TOKYO -- Subaru profits declined in the latest quarter amid steeper U.S. competition and higher costs at home where the company was engulfed in a faulty vehicle inspection scandal. The automaker's operating income tumbled 30 per cent to 73.1 billion yen (US$688.2 million) in the January-March period, the company's fiscal fourth quarter. Net income declined 9.8 per cent to 67.5 billion yen (US$635.5 million). Global revenue fell 6.4 per cent to 840.6 billion yen (US$7.91 billion) in the three-month period on a 4.9 per cent decline in global wholesale volume to 265,000 vehicles. Quarterly results were hit by higher fixed costs, incentives and warranty outlays, Corporate Executive Vice President Toshiaki Okada said on Friday while announcing earnings. Higher fixed costs stemmed from investments to expand production capacity in the U.S. and Japan. Subaru also spent extra to recall cars equipped with faulty Takata airbags and to recall cars that underwent inappropriate final inspection in Japan. Weaker performance in North America, which booked a decline in wholesale deliveries, also undercut earnings. The region accounts for 68 per cent of the company's global retail sales. Subaru is being pressured by intensifying competition in the company's mainstay crossover segment as other brands rush into the red-hot arena with rival offerings. Meanwhile, margins are being undermined by rising incentives and a deteriorating product mix. In calendar year 2017, Subaru's U.S. car sales marched ahead 8.5 per cent. But more profitable light trucks notched only a 4.2 per cent increase. Subaru corrected course in the January-March period, dialing back car sales 12 per cent as its light truck volume expanded 10 per cent. Subaru is banking on margins to improve with this year's U.S. introduction of the Ascent large-size crossover and the redesigned, fifth-generation Forester crossover. 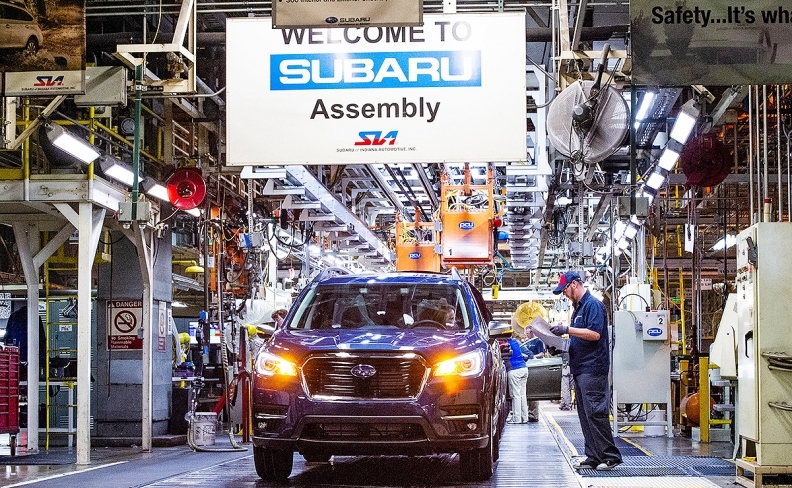 The Ascent, which just entered production in Indiana, is a new nameplate that takes Subaru into a segment where it currently doesn't compete and could expand its customer base. Subaru is still forecasting its 10th straight year of record sales in the U.S. But despite booming sales in North America, Subaru's biggest market emerged as a weak link in the latest quarter as rising incentives and slipping margins dented earnings. On the full-year basis, Subaru profits declined for a second-straight year. Operating profit declined 7.6 per cent to 379.4 billion yen (US$3.57 billion) in the fiscal year ended March 31, 2018. Net income dropped 22 per cent to 220.4 billion yen (US$2.07 billion). Global revenue advanced 2.4 per cent to 3.41 trillion yen (US$32.1 billion) in full year, as worldwide sales stagnated at 1.07 million vehicles. Falling regional operating profit in North America accounted for most of the full-year decline. North American operating profit plunged 35 per cent to 69.4 billion yen (US$653.4 million) in the full fiscal year. The decline came even as Subaru retail sales added 3.8 per cent in the cooling U.S. market to 149,703 vehicles in the January-March period. But Subaru has been dialing back wholesale shipments, which are the basis of parent company profits. U.S. wholesale volume fell 2.6 per cent to 161,900 in the fiscal fourth quarter. Sales in Canada declined 2.4 per cent to 12,300 units. Europe advanced 5.4 per cent to 11,700. Subaru is also under pressure at home. Last month, it admitted faking fuel economy and emissions data on vehicles in Japan for at least five years. Inspectors at Subaru’s Japanese plants, where it assembles such nameplates as the Impreza, Outback and Forester, altered figures on 903 vehicles. The faulty inspections did not affect export models. But Subaru said it needs to "reform its corporate culture from the ground up" to restore lost trust. Subaru's retail sales in Japan dropped 15 per cent to 46,867 vehicles in the first three months of the year as it grappled with the scandal, the first signs of which emerged late last year. After the first trouble emerged, the company recalled 417,288 vehicles in Japan. Speaking at the earnings announcement, CEO Yasuyuki Yoshinaga downplayed the impact on domestic sales, saying volume dropped in comparison to a surge the year before when the company introduced redesigned versions of the Impreza small car and Crosstrek. Still, Subaru took a 25 billion-yen (US$235.4 million) charge for calling back the affected vehicles for re-inspection. Other warranty outlays included an 81.3 billion-yen (US$765.4 million) bill for Takata airbags. In March, Subaru named North America boss Tomomi Nakamura its new global president to succeed Yasuyuki Yoshinaga, who has headed the company since June 2011. Yoshinaga, who concurrently serves as president and CEO, will keep the CEO title while stepping up as chairman. Nakamura takes the job in June, pending approval at the annual shareholders' meeting. Looking ahead, Subaru predicted profit would drop again in the current fiscal year ending March 31, 2019, undermined by a deteriorating foreign exchange rate. Operating profit is seen falling 21 per cent, while net income stagnates. Global wholesale volume is expanding 3.1 per cent to 1.1 million vehicles.